Paint has remodeling power when you use it to emphasize a room’s best features or play down the flaws. Every home suffers a few negatives, but not every solution requires pricey structural changes. Paint is an often-overlooked, low-cost remodeler’s remedy for common complaints with interiors, offering the chameleon-like ability to lighten, warm, enlarge, erase, or attract attention. 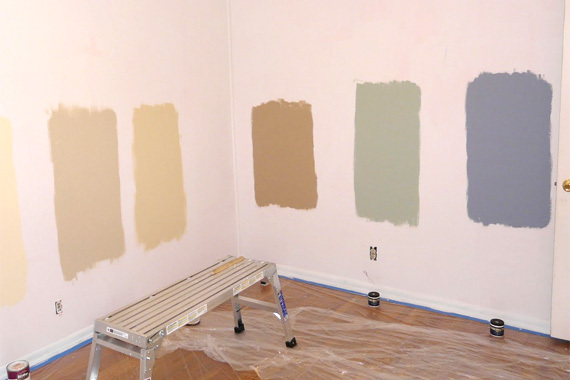 Check the space with the samples in place and watch how the paint color changes at different times of the day. Evaluate your reaction to the proposed colors: Does the space feel cozy or is the openness enhanced? Painting walls white, cream, pastels, or cool colors (tinged with blue or green) creates the illusion of more space by reflecting light. Paint trim similar to walls (or use white on trim) to ensure a seamless appearance that visually expands space. White or light colors lift a ceiling; darker shades can have a similar effect if you select a high-gloss paint sheen, which reflects light and enhances space. Employ a monochromatic scheme to amplify the dimensions of a room. Select furnishings in one color and paint walls and trim to match. Lack of contrast makes a room seem more spacious. Make walls appear taller by extending wall color onto the ceiling. Create a 6- to 12-inch-wide border of wall color on the entire ceiling perimeter, or wherever walls meet the ceiling. Vertical and horizontal stripes of alternating color can make a room grand. While vertical stripes enhance room height by drawing the eye upward, horizontal stripes lure your gaze around the perimeter, making walls seem further away. 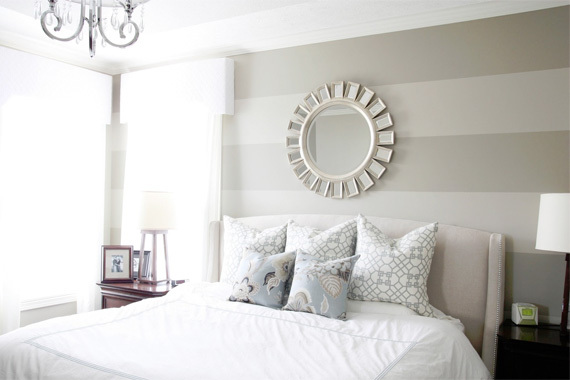 Use similar light colors for low-contrast stripes, and your room will look even larger. When a space feels cavernous, draw walls inward and make it cozy with warm colors (red-tinged) because darker hues absorb light. Similarly, a dark or warm color overhead (in a flat finish) helps make rooms with high or vaulted ceilings less voluminous. 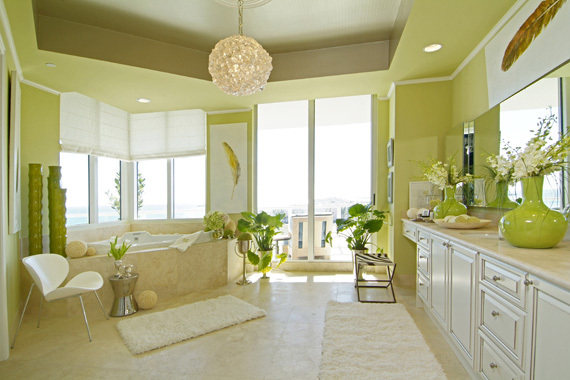 The right paint choice can lend tranquility to a bathroom, master suite, or other quiet, personal space. A palette of soft, understated color or muted tones help you instill a calming atmosphere. Some good choices include pale lavenders, light grays or greens, and wispy blues. Call out notable features in a room with paint. Dress crown mouldings and other trims in white to make them pop against walls with color. 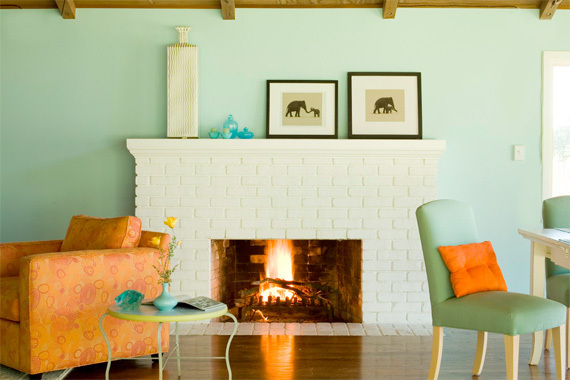 Make a fireplace or other feature a focal point by painting it a color that contrasts with walls. Not everything should stand out in a space. Using a low-contrast palette is a good way to hide unappealing elements or flaws. Conduit, radiators, and other components painted the same color as the wall will seem to disappear. Selecting low-sheen or flat paint colors also helps hide flaws. Unless walls are smooth, avoid using high-gloss paint because it reflects light and calls attention to an uneven surface. As a DIY job, painting a 12-by-12-ft. space costs about $150, including paint, primer, brushes, drop cloths, and other painting tools and supplies. A professionally painted room using high-quality, brand-name paint costs $200-$400. Nationally published home improvement writer Jan Soults Walker and her husband, Dave, once built a window seat with flanking bookcases into a kitchen. It remains one of their favorite storage projects to date.